May 14, 2012 October 9, 2013 / Julie Brook, Esq. The following is a guest blog post by Cynthia E. Fruchtman, of the Law Offices of Cynthia E. Fruchtman. Ms. Fruchtman represents and advises employers and employees on all aspects of the employment relationship and represents businesses in commercial and employment-related litigation in all forums. Home health care is expensive, especially when it is done right. 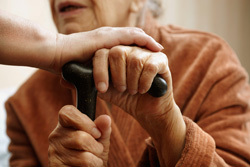 People who need home health care often try to avoid the expense by hiring caregivers through want ads or the internet or by word-of-mouth, and there are plenty of unskilled or minimally skilled individuals who are happy to receive room and board and wages in cash in exchange for caring for needy individuals in the individuals’ own homes. But this can result in problems, the worst of which arise when it comes to taxes, termination, or injuries on the job. Here’s a case in which two of those issues recently arose: An elderly couple paid $600 a week in cash to a caregiver who lived in their home and was to be available 24/7 to attend to their needs with administering medication, preparing meals, shopping, transportation to appointments, and light housekeeping. This particular couple had a twenty-year relationship with an astute bookkeeper who insisted on paying the appropriate tax on the $600 weekly wages; however, the caregiver was unaware of those payments. At the appropriate time, the bookkeeper prepared a Form 1099 for the caregiver showing gross wages that included the tax payments. The caregiver, not appreciating that employment taxes had been paid for her, was infuriated that she had not received the gross wages that were reported to the government. The caregiver had a stormy confrontation with the elderly couple, who were unable to explain to the caregiver how to read the Form 1099. The police had to be called to get the caregiver out of the couple’s home, and needless to say, the caregiver quit. Ironically, the caregiver filed for unemployment benefits which were only available to her because of the taxes paid by the elderly couple. The elderly couple, unfamiliar with the workings of California’s Employment Development Department, allowed the caregiver to collect those benefits. Not satisfied with those benefits, the caregiver then filed a claim as a housekeeper for unpaid overtime and missed meal periods and breaks with the California Labor Commissioner. As the couple’s lawyer, my first hurdle in defeating this claim was to find witnesses who could testify on behalf of the elderly couple, who were too frail and confused to defend themselves. The bookkeeper was too ill to appear. The couple’s adult children agreed to attend the hearing and speak to what they knew. My second hurdle was a lack of documentation. I had the Form 1099s and credit card statements showing grocery purchases for hundreds of dollars a week, but nothing to prove the caregiver’s duties. The final hurdle was presented by the children, who lacked knowledge of their parents’ day-to-day, hour-to-hour, needs. Ultimately, we were successful in defeating the caregiver’s claim. oversee caregivers to ensure that the services provided are appropriate for the individuals’ needs. Using an agency is not inexpensive, but the risks of going bare are too great, as illustrated by my elderly couple clients who were preyed on by an ignorant, vindictive person they took into their own home. Insurance may defray some of the cost, but the best protection is not doing it all yourself. The State of California’s Department of Aging is a great place to start. It’s a resource we should all become familiar with, not only for our clients but also for ourselves. For excellent coverage of the issues involved with an elder remaining at home, turn to CEB’s California Elder Law Resources, Benefits, and Planning: An Advocate’s Guide, chap 6. On the issues involved with hiring caregivers, check out CEB’s award-winning book, Special Needs Trusts: Planning, Drafting, and Administration, chap 15. Good informafion, informative. The only thing that was not mentioned is thus in real life when agencies are utilized, they do not allow one caregiver to consistently be involved so that the elderly couple can develop a relationship and are not required to show new aids the drill over and over. I feel this is done to help reduce the liability exposure, but is a hinderance to elderly couple.